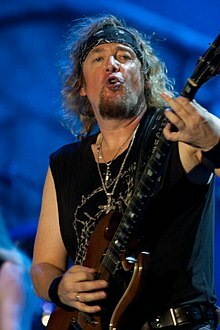 Adrian Frederick 'H' Smith (born 27 February 1957) is an English guitarist and member of Iron Maiden, for whom he writes songs and performs live backing vocals on some tracks. Smith grew up in London and became interested in rock music at 15. He soon formed a friendship with future Iron Maiden guitarist Dave Murray, who inspired him to take up the guitar. After leaving school at 16, he formed a band called Urchin, which he led until their demise in 1980. He joined Iron Maiden in November 1980, replacing Dennis Stratton.